Supporting optical audio, auxiliary and Bluetooth signals, the Leviathan is ready to take on anything your home theater or desktop can throw at it and transform it into a bass-heavy roar. Just when you think you really know a company, it goes and releases something completely out of left-field. Take Razer: historically, it’s been a peddler of pointers and the king of keyboards. Just look at the venerable Razer BlackWidow Ultimate or Razer DeathAdder Chroma. The $199 (£159, AU$279) Leviathan is many things for Razer. It’s Razer’s first sound bar, mainly, but also its first step into your living room and the consoles that live there. It’s the first product from Razer that can directly interface with your Xbox One and PS4 via its optical audio-in port, as well as your PC or TV through auxiliary in. But, more than any of that, the Leviathan represents an idea. Companies like Razer can do – and become – more than ever before. Best described as an all-black, half-size sound bar, the Leviathan measures in at 19.7 x 3 x 2.8 inches (W x H x D) and comes in around 4.5 pounds. Don’t let its dimensions throw you, it’s similarly sized to other entry-level sound bars, and it produces more than enough sound to compensate for its diminutive stature. On the front, you’ll find a speaker grille that guards two 0.74-inch tweeters and two 2.5-inch full-range drivers, a trademark silver Razer logo located in the exact middle of the bar, and a one-inch power button located along the top of the grille. Looking at the top of the bar you’ll find standard controls as well as the Bluetooth button used to sync the Leviathan up with your mobile device and a preset button that switches between game, music and movie modes. Spin it all the way around to find a proprietary subwoofer-out, DC-in, optical audio-in and auxiliary in jacks as well as two brackets for wall mounting. The Leviathan isn’t as well-stocked with ports as its higher-end competitors, but what’s there is amiably simplified to the bare essentials. The only real problem with the proprietary subwoofer port – which transmits power and signal to the external, matte black subwoofer – is that the cable sits loosely in the jack, and overall feels incredibly fragile. It’s commendable that Razer chose to include signal and power into a single cable – eliminating the need for the subwoofer to have its own power supply – but in the ideal scenario, and perhaps in the next iteration, the Leviathan should opt for a wireless subwoofer. As it stands, though, the subwoofer is one the Leviathan’s greatest assets. The little box pushes an astounding amount of air through its 5.25-inch driver and produces a rich, bass-heavy sound that doesn’t distort at its highest volume. I found the low-end a little too overpowering for my tastes, but if you’re a gamer that likes your bass to drop harder than the bodies of your opponents, you’ll no doubt come to love the little cube. Besides a few balancing issues, the overall quality of the Leviathan’s sound is good no matter which input you decide to use. The Dolby Pro Logic II codec will transform any signal (analog, optical or Bluetooth) into simulated 5.1 surround sound. It has to be simulated though, as the unit is one driver shy of true 5.1 sound. The effect is very subdued however, and anyone used to using a true 5.1 surround sound setup will notice a lack of distinct left and right channels. Cycling through the presets often alleviates a few of these issues (the music mode really does do a good job of providing some balance to the mix), and the obscenely affordable price mitigates almost any complaint. 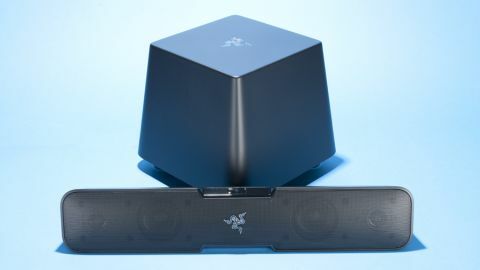 For $199 (£159, AU$279), the Razer Leviathan is a great sound bar, and is easily recommended for gamers who just aren’t ready to dive into a full 5.1 system yet. It’s a bit bass-heavy, thanks to the standalone subwoofer – but even so, movies and games come through clear. The bar is relatively versatile, too. It’s plenty powerful for a PC, but it works out of the box with any console or TV through optical audio out. Not to mention that built-in Bluetooth lets you connect your mobile device when you aren’t directly in front of your entertainment setup. A few tweaks, like a more stable subwoofer connector and a remote would’ve been nice. But, in spite of its diminutive size, the Leviathan far outgrew my expectations.